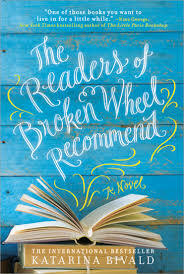 a book chick: "The Readers of Broken Wheel Recommend"
"The Readers of Broken Wheel Recommend"
my take: Sara arrives in Broken Wheel, Iowa from Sweden ready to meet her pen-pal and take a little vacation from her dull life. Broken Wheel is probably one of the more dull places to visit, but Sara finds much to love. I so wanted to love this. I was in need of a feel good read after a few heavy hitters. Halfway thru I was MEH. And. I finished it. Although I wanted to quit. I do like to see if a slow starter, not-so-great read can be redeemed. I'm all for redemption. There's loads of book titles dropped and a bit of book prescribing going on. The best part of the book was how Sara arranged/grouped the books and enticed readers with her category names. my verdict: So-so feel good read ... so so many other books to choose. I have to say, readers of this book...don't recommend. Me too, so wanted to love it, but hardly liked it.